Russian immigrant Matilda Rabinowitz (1887–1963) was a feminist, labor organizer, and mother. In her memoir, written in her later years, she describes life in the Pale of Settlement and tells the story of her journey to America, her political awakening and work as an organizer for the IWW, and, in her personal life, of a turbulent romance and struggle to support herself and her child. 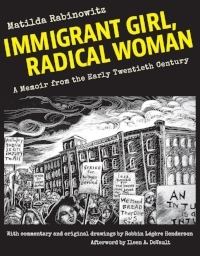 Matilda’s granddaughter Robbin Légère Henderson added commentary and illustrations for Immigrant Girl, Radical Woman, recently published by Cornell University Press. Robbin Légère Henderson is an artist and writer whose work has been shown internationally, and most recently at the Contemporary Jewish Museum in San Francisco. Henderson received her B.A. in English literature at the University of California at Berkeley, with further study at the San Francisco Art Institute. Co-sponsored by the Workmen’s Circle/Arbeter Ring of Northern California.